Video Deposition footage can often make the difference in a mediation or a trial. We all know that there are nuances and subtle (sometimes not so subtle) visual cues that often tell more of the story than the deponents actual spoken words. The biggest challenge with video deposition footage is locating and sharing the relevant portions of video. Whether you are creating a testimony plan with video for trial or just looking to learn more about a specific are of interest; SIX14 Production’s SYNC Service puts the power in your hands. Search through your video depositions based on keywords, create custom video clips and share them with others. SYNC (Legal Deposition Video Synchronization) is also a remarkable timesaver whether you are using in trial presentation or trial preparation. Our synchronization service works with the leading legal industry software applications like TrialDirector, Sanction, Summation, LiveNote and Trial Max. We provide a free Synchronizer software application for playback and trial preparation if you don’t already use a trial prep system. Virtually any type of file or media can be synced. We work on PCs and Macs. Our customers trust SIX14 Productions Inc. to deliver the ultimate combination of accuracy, ease of use and timely turnaround. Additionally, we provide a full range of legal video deposition videography services and trial presentation support. 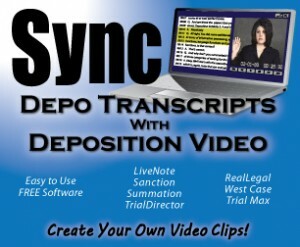 Give us a call at (323) 419-1244 to learn more about SYNC – (Transcript Synchronization with Legal Video Deposition).